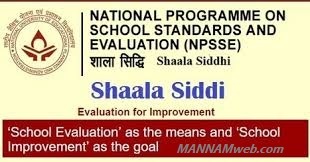 The National Programme on School Standards and Evaluation (NPSSE), known as Shaala Sidhdhi is a comprehensive instrument for school evaluation leading to school improvement. Developed by the National University of Educational Planning and Administration (NUEPA), it aims to enable schools to evaluate their performance in a more focused and strategic manner and facilitate them to make professional judgments for improvement. The programme’s objective is to establish and refer to an agreed set of standards and to provide clear pathways for each school for self evaluation, by focussing on key performance domains and their core standards for school evaluation. The structure of the Framework is simple yet flexible and lends itself to both self and external evaluation.